COLUMBUS / KY cds with indiscernible date on cover to Mifflin Tenn., manuscript "Due 5" and in the same hand "I Paid 5 Cents postage M.S.E. ", soldier's endorsement “From a volunteer in Co. I 13 Regt. 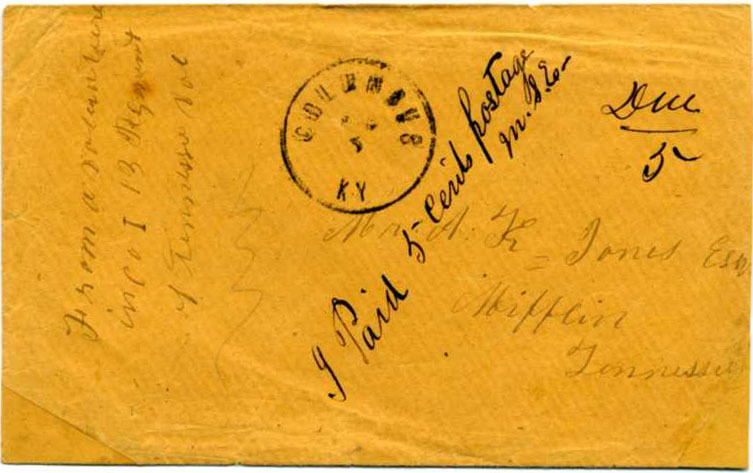 Tennessee Vol.”, reduced at right with bottom right and left corners clipped and repaired. Rare and unusual, Ex Schwartz. $700.